Howdy y'all! I've danced around this subjecty a few times but never did a full-on blog about it so here goes! Please note that this will be part ONE in a two-part series, in part TWO, I'll discuss TONE pots. There is a little confusion out there, and even some downright wrong info, so listen up ... your tone depends on it! Use smooth audio-taper (logarithmic) pots for volume controls. But I know y'all ... you want to know why and how ... right? read on! First let's talk about what a potentionomer actually is (pot for short). A pot simply inserts a variable amount of resistance into a circuit, dead simple! There are three lugs on the typical pot with which to solder your leads to, the center lug is the "wiper" arm which travels towards or away from the lugs on each side, the closer it is to a side lug, the less resistance there will be; inversely the further the wiper is away from one of the side lugs, the more resistance there will be. Make sense? If not, re-read this paragraph and check out this diagram until it is crystal clear ... unless you understand the concept of a potentionomer, nothing else will matter! Simple enough, right? Okay ... let's move on to the details that effect TONE! The Value of a pot: this seems to be what folks most often discuss, and rightfully so, as it is ultimately the factor that most effects tone! But right up front we need to define what the "value" of a pot actually TELLS US. Guitar pots are valued as 25K, 250K, 500K, and so on ... but do you know what exactly this means? It is the resistance measured from the center lug to one of the outer lugs, when the wiper is turned as far away from that lug as possible; in other words, it is a measurement of the MAXIMUM amount of resistance the pot can introduce into the circuit when the pot is completely "turned down". In essence, it is a reflection of the type and amount of resistave material used in the pot. So, how does this effect tone? The quick answer: even when the volume is turned up fully, higher value pots will ultimately produce a brighter tone, and lower value pots will produce a less bright tone. Why? Because when a pot is fully turned up, there is still a measurable amount of resistance in the pot; in the case of 500K pots this is usually about 2-5 ohms, and in the case of 250K pots it averages in the 5-12K range, and with a 100K pot it's actually a whopping 100 ohms or more! In other words, even fully "up" the volume control is still shunting a few electrons to ground, the higher the value when the pot is turned fully "down", the lower the value is when it's turned fully "up". Now, you must understand how a pot "turns down" the signal ... by progressively shunting more and more electrons to ground. Now if only a small amount of your guitar's signal is directed to death by grounding ... the few that die are going to be the smallest and weakest ones ... the high frequencies! And so, the 3 ohms or so of resistance in a fully "up" 500K pot results in a brighter tone than the 7 ohms of a 250K pot. The Take-Away: 250K pots are generally used as volume controls on single-coil guitars like Strats and Teles where you need to keep the already bright pickups from getting too bright; 500K pots are generally preferred on the darker humbucker designs to keep them from getting too dark. A side-note: 25K pots are usually used with "active" pickups which contain a built-in pre-amplifier which converts the high impedance of the pickups (8-16K-ohms) to low impedance (100-300 ohms); if you were to replace the pickups in a standard guitar with active pickups and failed to also replace the pots with 25K ... you would wind up with very shrill tone, ugg! And the last word on VALUE ... now that you know the rules feel free to break the rules! If you want to really make your Tele bright, switch to 500K pots ... shoot, early Teles actually came with ultra-bright 1meg pots! Oh, and if you like to live on the fringe ... there are also some in-between value pots out there like 300K and 450K which can be perfect on say for instance a guitar that has a combination of both single coils and humbuckers! Originally, all pots were what we refer to a linear with a smooth run up to full value, meaning a 500K pot would read 500,000 ohms (500K) of resistance when turned all the way down, the afore mentioned 2-5 ohms when turned all the way up, and at the half-way point it would provide about 250K of resistance ... and of course a quarter up would read 375K and three-quarters up would read about 125K ohms. From an electrical perspective, this makes perfect sense, problem is our ears do not hear on a linear scale, they hear on a logarithmic scale! A super-quick refresher here: linear is 1,2,3,4,5 and so on whereas logarithmic is 1, 10, 100, 1000, 10000 and so on. Big difference, right! And so, in a perfect world, our guitar volume pots would all be log taper (also called audio taper)! 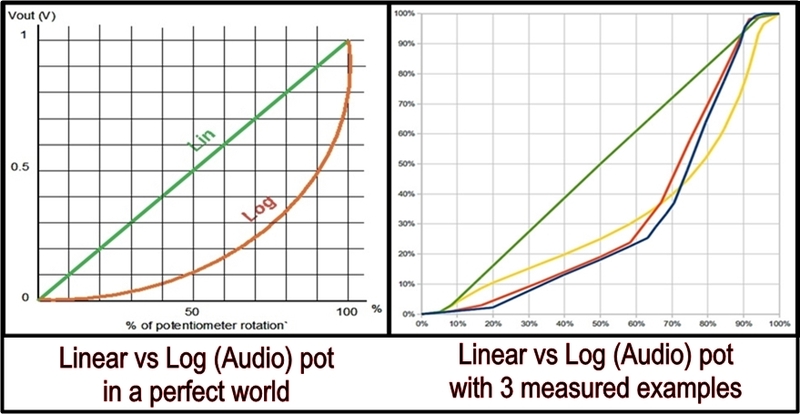 Here is a graphic comparing the linear progression of a pot vs the logarithmic operation of a pot specifically tailored to respond in the same way our ears hear audio. Notice how the real world audio-taper pots have a couple of elbows where the taper shifts rather dramatically, as opposed to a nice smooth logarithmic movement. You see, all the manufacturers balance cost to consumers with performance, and they are not all the same! This takes us into our last major item of discussion! But first, here is a great video I ran across with a nice demonstration of how linear and audio tapers actually SOUND, check it out. The various BRANDS of pots! The Three major brands of pots readily available for guitar use are Bourns, CTS (Chicago Telephone Supply), and Alpha. (Click on names to be taken to product info pages) All three are decent quality ... way better than generic made-in-China pots! However, there are some differences I've found that I'd like to share with you. For brevity and ease, I'll present this info as bullet-points. CTS has a long history in providing guitar specific pots, for this reason many, especially older, folks see them as a premium component. Despite the above, CTS pots are often way off-spec, the only way to guarantee close tolerance to listed specs is to pay extra for the close-tolerance (10% +/-) models, otherwise CTS only adheres to a +/- 20% tolerance. So a "500K" pot may be from 400-600K max resistance, and 2-16 minimum ... not good enough for me! Bourns tend to nail their specs, even though they list +/- 10% tolerance, I've never measured a Bourns off by more than about 2%, that's awesome! Bourns pots tend to have very low resistance to being turned (they turn easily), this can be good or bad, depending on your preference. Personally, I HATE these in the volume control of a traditional Strat, which is placed sooo close to the bridge pickup and always hit with the strumming hand ... those slippery Bourns pots always inadvertently end up turning themselves down! CTS, by comparison, are much tighter feeling ... I like that, but if you are one of those players who wraps your pinky around the pot for constant volume swells, you might well prefer the easy-turning Bourns. Alpha pots tend to lie in between the other two, not as easily turned as Bourns, but a little more so than CTS. Alpha seems to be moving away from guitar specific pots, and more towards industrial, so they are not as commonly found at guitar suppliers as they were a decade or so ago. Bourns, by comparison is moving with haste into the guitar specific market, offering some VERY quiet, smooth, long-life, top-end models. but they are expensive and their audio taper looks (and sounds) like a crow's elbow. CTS also offers a top-end guitar specific pot, the 450G, check them out! These are available in 10% or 20% tolerance, Choose the 10%! They are also available in a whopping EIGHT taper patterns, ensuring you can find something that feels just perfect for you! Personally, I love the "B" or "BD" curves. Alpha pots are also available in many different tapers, but these days all that's ever available are A (Audio) or B (lin), that's too bad. Special orders: All three companies are open to making a batch of whatever you personally want ... provided you want at least a hundred or so of them and can wait a month or more for them to arrive. Guitar shops should take advantage of this to offer their clients something different, and possibly closer to perfect, than the big stores! Personally, I had Alpha whip me up a batch of super tight tolerance (+/-)1% 250K smooth audio-taper pots with added high-viscosity (they turn hard, bu smoothly). I had these made because almost EVERY Strat player has the same problem I do ... that darn volume control always creeps down on them while playing ... but not with my pots!